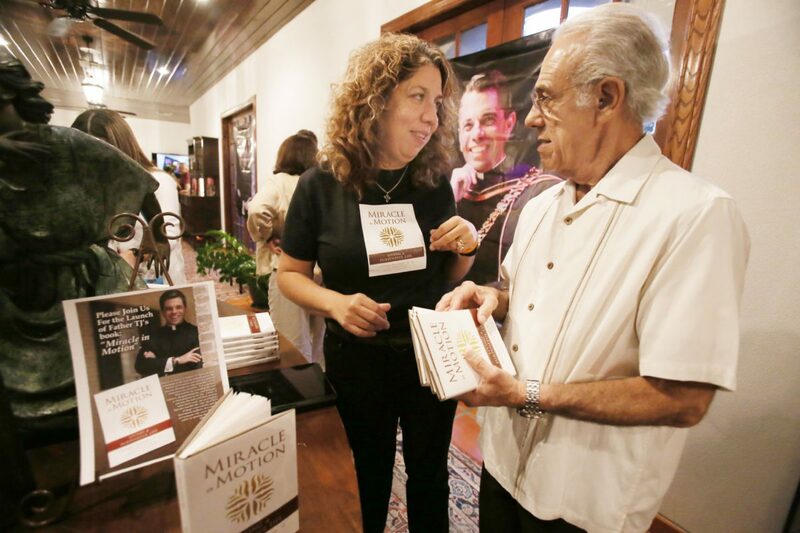 Many Brownsville residents, friends and family came to support the release of Father T.J. Martinez's book "Miracle in Motion" Tuesday, Oct. 17, 2017, at the home of Brownsville Mayor Tony Martinez. Father T.J. Martinez passed away of stomach cancer in 2014. BROWNSVILLE — For Father T.J. Martinez, the most disappointing thing about dying young was that he wouldn’t be around to mentor the kids he’d nurtured through high school but were in danger of stalling out in college. So says his friend, David Warden, a Houston attorney, adjunct professor of engineering and economics at Rice University and co-author of “Miracle In Motion: How to Live a Meaningful Life,” Martinez’s legacy of advice for “his kids” at Cristo Rey Jesuit College Preparatory High School, founded in 2009 with the mission of serving Houston’s most disadvantaged youth. Martinez, the eldest son of Brownsville Mayor Tony Martinez and Carol Berryman, was the school’s founding president, renowned for his charisma and passion in advocating for that mission. He died of stomach cancer on Nov. 28, 2014, at the age of 44. “Miracle in Motion” was celebrated, along with Martinez himself, at a well-attended launch party Oct. 17 at the mayor’s house. All proceeds from sales of the book — available online at Amazon.com — will go to benefit the school, part of the national Cristo Rey Network of college prep high schools. Warden said the idea for a book came about the night Martinez decided to stop his chemotherapy treatments, expressing regret he wouldn’t be around to help guide his graduates into adulthood. “We were sitting around and I said, ‘Why don’t you write them a note?’ After another glass of wine or two, that turned into a book,” Warden said. Next came a detailed outline of what Martinez thought the kids needed to know as they matured. The two wrote the beginning and the ending together, with the middle part a lengthy series of bullet points that would be fleshed out later, Warden said. Martinez gave him all his personal materials to work with — emails, pictures, letters, etc. The book also relies heavily on the contents of a diary kept by Martinez’s brother, Trey, a Brownsville attorney, during his brother’s last months. He described the period with his brother as one of the best and worst times of his life. “The faith and the grace that T.J. taught me during that time, and living in a Jesuit community of priests, it really tends to help out quite a bit,” Trey Martinez said. Warden said the book was a massive team effort that also involved Martinez siblings Andy and Melissa, who helped make sure their brother’s voice came through. About two weeks before he died, Martinez sent Warden an email saying he was on his own, passing along the names of 20 people he wanted him to interview for the book. Martinez also pointed him in the direction of a close friend who would prove invaluable in bringing the projection to fruition: Father James Martin, a New York City-based Jesuit priest and best-selling author. Martinez told Warden he would be with him “in spirit” as he finished work on the book. Warden traveled to New York to see Martin. However, Martin lined Warden up with an editor and located a publisher (Paulist Press). Warden, who had never written a book when Martinez asked him to take on the project, said that although his name appears on the cover he actually had little to do with the finished product. “Anybody who knows me and then reads the book knows that that’s not me talking, that I would never know anything about those subjects,” he said. “I would sit there in the room, gather the material, kind of outline the thoughts, and there was a spirit in the room — had to be, guiding me. Trey Martinez said his brother’s hometown seemed like the ideal place for a launch party, noting that a second event is scheduled for Nov. 16 in Houston.